RCMP are searching for four suspects who broke into a hardware store in Kinuso early Tuesday and made off with 40 firearms. In a news release Wednesday, Faust RCMP said a pickup truck pulled up to Kinuso Mercantile (Home Hardware) at 5 a.m. Tuesday. 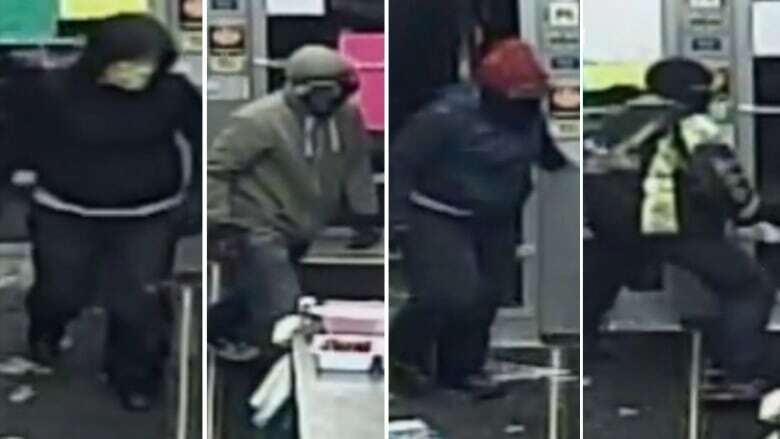 Four suspects — two males and two females, all wearing masks and gloves — got out of the truck and smashed the glass entrance doors to the business. They stole 40 firearms "consisting of various shotguns and rifles," and some electronics and clothing, police said. They left the store in under five minutes. The investigation continues. Police released surveillance photos of the suspects and the pickup truck. Anyone with information is asked to contact Faust RCMP or Crime Stoppers. Kinuso is a hamlet on Highway 2, about 300 kilometres northwest of Edmonton.